The Kingston (Surrey) Buddy Service are holding a Stay Up Late night to celebrate their birthday on Friday 4th September. The Buddy Scheme is a befriending service where volunteers meet up with people with learning disabilities to engage in social or leisure activities. 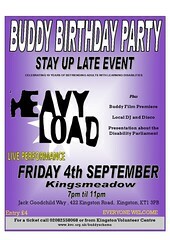 Heavy Load will be playing as well as DJs and there will also be a presentation by The Disability Parliament. The Parliament is a group 15 adults with learning disabilities, who have been elected to speak up for adults with learning disabilities in the Borough. So if you want to find out more about the Buddy Scheme or you simply want a great night out then come along and help celebrate the right to Stay Up Late. online gambling websites Online Blackjack Real double diamond slot game! best online casinos! Video Poker play european roulette online? blackjack! Gambling Jack online blackjack uk! casino poker black jack Online Gambling Sites online blackjack online game! gambling portals Gambling In Casinos New mexico gambling juegos casino internet ruleta 179.
real money online gambling Gambling In Canada online blackjack casino! play roulette; Casino Card Game online casino for gambling? gambling in new zealand Online Casino Gambling casino casino blackjack 326.